What astounded me about Share This Too was the sheer magnitude of content crammed into one book! 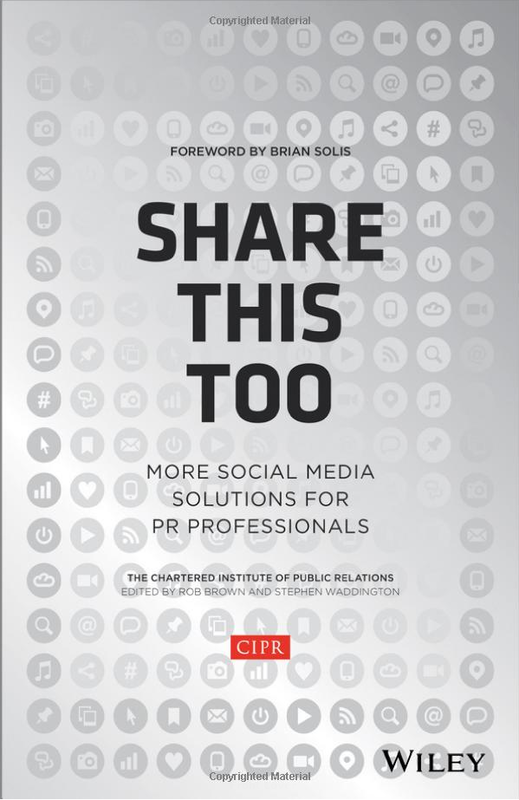 The vast number of well-respected contributors, each with specialist knowledge in different areas of the PR industry, gives the book that credibility that it needs to serve as a go-to handbook of the PR profession. However, as so many topics are covered in-depth throughout the book, I’ve decided to review three chapters individually in order to create a more specific and informed review. In Chapter five, Kate Matlock explores Digital Anthropology, a term I hadn’t come across in this context until now, which refers to the study of how online communication is impacting our culture and behaviour. Focusing on how this shapes our social relationships, Kate explains she isn’t an anthropologist, just a social PR professional who has performed extensive reading into a topic she finds fascinating. She provides a commentary on our changing social etiquette and relates this to table manners, attention span and even break ups in an excellent approach to make the comparison specific to our everyday lives. Although she may be covering simple ideas we’ve all thought about, she does so with reasonable, detailed research that supplies proof behind our common theories. The Visual Web was the next chapter I decided to review, as being a female teenager this is one aspect of the web that envelopes a lot of my own personal time, I’m ashamed to admit! Dan Tyte looks at three of the main visual contenders online; Facebook, Instagram and Flickr. Interestingly, Instagram seems to have overrun its competitors who provided ‘slow moving mobile apps’ due to its ideal mobility, and “shareability at its very core”. He also queries whether the infographic could replace the press release, which seems like such a simple idea until you realise it’s never occurred to you before! Competing with more online than ever before, if an organisation can capture the attention of their audience with a ‘visually striking infographic’ rather than copy written for a press release, the possibilities are seemingly endless. Finally, Corporate Social Responsibility (CSR) has interested me since writing a feature on a lady called Kat Sparkes in my first year. She runs an agency called The Flamingo Foundation, which encourages organisations to aid various global projects. Stuart Bruce gives an effective overall summary of what SCR aims to achieve, and ties in the link between companies ‘ranking the highest in SCR performance’ and innovative social media use, further stressing the point that effective social media utilization can be the difference between a business’ success. With intelligent insights into crowdsourcing, partnerships, and crisis communications I’m inspired to complete further research in the future. He does an excellent job of making CSR sound like something everyone needs to have a greater understanding of in the new online social realm we have entered. To summarise, Share This Too is near enough everything I hoped it would be. With informed perspectives covering a wide range of topics, not only can I refer back to this in my future studies, but I can actually read this as a book of interest on my bookshelf. These ideas are current, and it’s rare to find a book that doesn’t feel powerfully outdated by the vastly changing sphere of the internet. Overall, top marks!